The Ministry of Defence is probing claims that British forces killed two Danish soldiers in Afghanistan in a "friendly fire" incident. The soldiers died when heat-seeking missiles were fired at a Danish military unit on 26 September. A spokesman for the MoD said it is working alongside the Danish government to try to find out what happened. The deaths of the Danish personnel were initially reported to have come in a firefight with the Taleban. However, several days later the Danish army said the casualties may have been the result of British so-called friendly fire in the southern province of Helmand. A Danish eyewitness told a journalist from TV2 television UK forces were firing across the Helmand river at the Taleban for at least an hour. It was said during that time two British missiles hit a Danish compound. An MoD spokesman said: "We are working closely with the Danish government to establish the details and the causes of this incident, and there is a Board of Inquiry into it, ongoing. "It would not be appropriate to comment further before the Board of Inquiry is complete." Denmark has about 550 troops operating in Afghanistan as part of Nato's International Security Assistance Force (Isaf) and has lost seven service personnel in total. 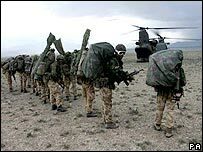 There are about 7,700 British troops based in Afghanistan, mainly in Helmand.